Ken Fetterolf is the Vice President of Horst Construction. 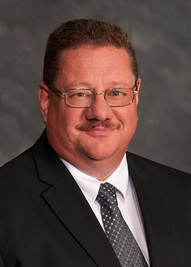 Ken has over 30 years of experience in the commercial construction industry and hands-on experience in every aspect of the business, ranging from Field Superintendent, Project Manager, to Vice President of Horst Construction. Throughout his career, Ken has successfully managed the construction of all building types, including religious, senior living, commercial, industrial, private education, and healthcare projects, and is skilled in managing projects under the Guaranteed Maximum Price, Construction Management and General Contracting contract scenarios. Ken provides executive leadership throughout all phases of each Horst project, encompassing preconstruction planning and design with the client and project team, to construction feasibility, monitoring cost and schedule, through the obtainment of the Certificate of Occupancy. Ken is committed to providing our clients a construction process that responds to their needs, values their resources, performs effectively and provides them with an exceptional final product.